593 runs were scored in what, after bowlers had ruled the roost till date, ended up as a batsman's final -- and despite that, defending champions Australia kept its grip on the World Cup by a whopping margin of 125. The game was characterized by some spectacular batting -- but the really fascinating part of the final contest between a resurgent India and a rampant Australia was the tactical cut and thrusts, the moves and countermoves that this game was full of. Australia made one change, omitting the all-rounder Ian Harvey and bringing in Damien Martyn into the number four slot. India, for its part, kept an unchanged line-up. Ricky Ponting called wrong and Sourav Ganguly elected to bowl first. It is a decision that is going to come in for some analysis; ditto flak. At this same ground, on April 16, 2000, Australia had made 205 batting first, and lost to South Africa. In 71 matches since then, Australia has never failed to defend any score in excess of 200; in that period, it has lost only 14 times and on 11 of those occasions, it lost chasing. Looked at another way, India, after its famous 1998 triumph in Sharjah chasing a big Australian score, had won only four of 15 encounters -- and on each occasion, India had batted first and put up scores of 307, 265, 315 and 279. Precedent, thus, dictated that India's best chance lay in batting first -- but Ganguly had his own reasons. He pointed out that the pitch was moist, which it was -- thunderstorms late last evening and a bit of rain early this morning meant the covers were left on too long, the pitch had a few damp spots as a result (in fact, the ground staff attempted to blow-dry it ahead of start of play) and there were clouds overhead. All of this meant that there was something in�it for seam bowlers -- and Ganguly backed his resurgent pace attack to exploit the conditions. On balance, it was a good call from Ganguly -- you wouldn't want to blame the captain for the fact that his bowlers lost the plot. First 15 overs: On such tracks, you want your bowlers to bowl line and length and let the pitch do the rest. It was doubly important to get off to a good start. Zaheer Khan, bowling the first over, however got excited and sprayed it around -- the first over, punctuated by wides and no balls, went for 15 runs; that set the tone for a first spell that produced 28 runs in 3 overs from Khan. Srinath began with an over costing just two runs. Gilchrist seemed to decide that it was important to knock Srinath off his length as well -- and went after him with a vengeance, knocking him around for 16 runs in his 4th over. Ashish Nehra and Harbhajan Singh were forced to come in earlier than Ganguly would have wanted to introduce them, to try and reduce the carnage. No matter -- the first 15 overs produced 107 runs, for the loss of one wicket. It was a parade of spectacular strokes ---� a superb off drive by Hayden off Khan in the first over, a smashing off drive by Gilchrist off the same bowler in the third, a pull by Gilchrist off Srinath in the fourth over, a superb square drive off Srinath and then an upper cut over point fours in the 6th� over. All that was prelude to the 8th over, when Srinath went around the wicket and was square driven for four off the first ball, then pulled, twice -- the second ending up well over midwicket for six. Nehra's introduction changed things around -- both Gilchrist and Hayden found themselves unable to pick the ball coming in to the left-hander from the one going away. Harbhajan, meanwhile, made the ball turn dramatically from ball one -- and Gilchrist, in some strife, attempted to swing his way out of trouble, mishit once, repeated the shot, and holed out with a second top-edged sweep to deep midwicket. During this period, Australia carried out its gameplan to perfection, battering the Indian new ball attack and ensuring that it never managed to gain the upper hand. India, meanwhile, missed a bit of a bet: at Centurion, a similar opening by the Aussies had been checked momentarily with the introduction of spin; more to the point, Stephen Fleming had against the Aussies brought on Daniel Vettori as early as the fourth over and caused problems to the openers, who like the ball coming on to them and seem a bit uneasy against the turning ball. 16-30 overs: This was the only period in the first innings when India got a look in. There was the dismissal of Gilchrist; Hayden, clearly off form, was playing within himself and struggling to move up the gears; Ponting looked very ill at ease at the start of his innings, and Nehra and Harbhajan combined beautifully. In the 19th over, Nehra (6-0-25-0, a beautiful spell of seam bowling in which he, unlike his colleagues, concentrated on the right length and line) went off and Srinath (4-0-33-0 in the first spell) came back on. In the very next over, Harbhajan Singh floated a ball just short of driving length, pushed Hayden back on the back foot, spun the ball from leg across the left hander, and took the edge for Dravid to hold. That brought Martyn and Ponting together -- and Martyn, starting off with a back foot square drive off Srinath in the 21st over, hit his straps. Working the ball around beautifully, pulling and driving with precision, he took on himself the onus of scoring at speed. 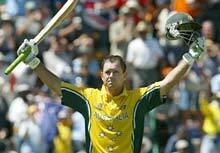 This allowed Ponting to steady his nerves and settle down to working the singles. The 25th over brought up the 150 of the innings. Ganguly, meanwhile, began to face a few problems -- he needed to take Harbhajan off as the off spinner ran out of overs (7-0-35-2); Sehwag came on in his place and bowled a controlled line and length, going for a mere 14 in his three overs; he was replaced by Dinesh Mongia who did equally well. Tendulkar went for 20 in three, and was clearly rusty from not bowling, as he mixed good deliveries with full tosses -- surprisingly, Sehwag who bowled with great control and even caused a few problems to both batsmen, wasn't brought back as replacement. Australia, without taking any chances,� moved to 184/2 in 30 overs; the period also saw the 50 of the partnership off just 50 deliveries with Martyn being the engine (25 off 24 deliveries). Overs 30-40: Ganguly needed to squeeze in his main bowlers somehow. He figured on bringing Zaheer Khan back in the 31st over -- and the move proved costly. Ponting and Martyn went after the bowler who was clearly off colour -- 13 came in the 33rd over and Khan had gone for 46 in his first five overs. The 35th over saw Yuvraj Singh coming on -- and Martyn pulled to wide midwicket to bring up his 50 off just 48 deliveries; an innings of extraordinary quality as it allowed his captain to bide his time. The structure of the innings can be judged from the 19 dot balls and 18 singles, plus five twos, he had scored at that point besides the boundary hits. India's faint chance, in the 38th over, came when Ponting, looking to swing Mongia over midwicket, missed and was hit on the pad in front of middle stump. The batsman had come down the track; on the other hand, the ball was clearly heading for middle stump, but umpire Bucknor turned the appeal down; the over also brought up the 100 of the partnership off 106 deliveries. The 39th over was worth noting, as it signaled the passing of the baton from Martyn to Ponting. Till then, it was the former who did the scoring while Ponting played the percentages; Harbhajan came back on in the 39th and Ponting opened out. Off successive balls, he came down the wicket and deposited the off spinner high over wide midwicket -- a calculated assault that paid off big time as Ganguly took his off-spinner off at once (Singh never bowled again, and you had to say that was an oversight). Australia, at the end of 40 overs, had 250/2 on the board. Overs 41-50: This period was pure Ponting. In the 41st over, Nehra lost control of an attempted slower ball; Ponting swung the resultant full toss one handed over square leg. In the next over, Ponting went down the track and got under a Dinesh Mongia delivery, striking it superbly over long on fof another six. Zaheer Khan was brought back in the 44th over -- and Ponting promptly wound up and blasted him back down the track for four; Khan replied with a full toss and Ponting smashed him over long on for six. Martyn produced a lovely shot in the 47th over when he stepped away and square drove Mongia for six, but the end overs were all Ponting -- it has been a long, long time since anyone ever drove the ball so well, so hard, and in so many different directions. Bowlers came and disappeared; others (Sehwag, Bajji, Singh) weren't tried. Zaheer Khan kept coming back on -- in the 44th over, which went for 12, in the 49th, which went for 13. Srinath, whose slower pace was meat and drink to batsmen in overdrive, went for 10, 12 and 18 in the 46th, 48th and 50th respectively and when the dust settled, Australia had posted a mammoth 359/2. Interestingly, though Martyn was approaching his 100, Ponting refused to take his foot off the pedal. He was the one striking the ball harder, so he kept the strike; Martyn, too, took singles and let his captain have it rather than look for his own landmark. Nehra alone among the seam bowlers came off with honors; Khan went big time each time he came on to bowl, Srinath had a disastrous last three overs. Harbhajan produced the star turn -- strangely, he was taken off after Ponting went after him in that one over, and never got the ball again. Overall, the Australian batsmen held on to their nerve; the Indian seamers failed to locate their own. Ponting's innings encapsulated Australian cricket -- he was shaky at the start but hung in there grimly in the shadow of his partner; the Indians failed to press home that advantage thanks to over-excited bowling, and Ponting, once he found his feet, made them pay. The statisticians will come up with the records -- first hundred by a captain after Clive Lloyd, in a Cup final; highest partnership, and so on. Never mind the figures -- it was, quite simply, magnificent. The Indian chase: It was a huge, almost impossible, ask; it was made more complicated by looming thunderclouds. But then, India knew about the weather going in; the wicket remained good for batting. What was needed was a firm start. Tendulkar took first strike, and the clear intention was to go after McGrath. In the first over, he pulled one savagely from outside off through the on side for four; then, as in the earlier meeting between the two sides, took to floating across his stumps. There was premeditation in the move -- Tendulkar clearly expected McGrath to bowl outside his off stump. The bowler, instead, made one bounce on middle; Tendulkar was too far to off as he went for the pull, found himself cramped, and put it in the air for McGrath to hold at short mid-on. That brought Ganguly to the wicket -- and from the outset, he kept dancing down to McGrath, much to the latter's bemusement. In between, Sehwag flicked Lee off his pads for four, then repeated the shot in the 4th over and was caught by Martyn at square leg off a no ball. In the fifth over, Ganguly top edged an attempted pull over Gilchrist for four, then stepped to leg to make room and carve McGrath over point for six. Sehwag in his turn upper cut the last ball of that over for six over point. Ganguly then looked to step to leg to hit Lee through the off and, after failing once, pulled it off in the sixth. Sehwag drove a yorker length delivery from Lee in the eighth over, showing great footwork to make room; Ganguly in the next over went down the track to cover drive McGrath for four, and the 50 of the partnership came up off 47 deliveries. It was desperate stuff -- and it came to an end in the 10th over as Ganguly, after three failed attempts to swing Lee to leg, finally landed the shot and hit it down the throat of mid on (57/2). The next over produced more disaster -- Mohammad Kaif, without moving his feet, swung a drive at McGrath and edged to the keeper. By now, a cloud burst threatened. Ponting, in an attempt to race through a few overs, brought on Brad Hogg and Darren Lehmann -- and Sehwag went into over drive. The 14th over saw Lehmann clubbed through the on side for three successive fours; the 15th saw him loft Hogg over cover for four, then hit even harder and further, over wide midwicket, for six. Ponting promptly took Lehmann off and brought on Andy Bichel -- and Dravid joined the party, flicking off his hips for four through mdiwicket in the 16th over. The 17th over produced the 100 of the innings, off 106 balls -- the fact that India was going along at that pace despite the loss of three wickets indicating how good the track was to bat on, and how rank bad shots by Tendulkar, Ganguly and Kaif was costing the team. At the end of that over, the rains prompted the umpires to take the players off. Play resumed after a hold up of around 20 minutes -- and Sehwag began to pile up the pressure on the Aussies. McGrath bowled the 19th, and went for 6 runs; Bichel bowled the 20th, and went for 7 including a superb short arm pull for four; Hogg bowled the 21st and Sehwag smashed him through midwicket for four; in the 23rd over, Hogg watched in bemusement as Sehwag went on his knee and swung a delivery from off over midwicket for six, then got under a delivery and elevated it over cover for four. At the end of 23 overs, India had made it to 145/3; Australia, at that point, were 144/2 � the chase was on. Ponting by then had problems -- McGrath had gone for runs; Lee had only four overs left; Bichel was being played with ease, Brad Hogg was being massacred. That meant three of four regular bowlers were proving costly; he couldn't even think of using his fifth bowler. A few more overs of this, and India would have been right back in the game. Superb fielding -- and an unfortunate slip -- brought Australia back into the game. Sehwag drove firmly to mid off. Bichel slipped on his follow through, then got up again and spun around to see what was happening. Sehwag, meanwhile, was running with the shot; he found Bichel in his way and had to run around him. Lehmann at mid off attacked the ball, picked up, and hurled the stumps down in one fluent move, and Sehwag was gone -- and unfortunate end to a great knock. At the 25 over mark, India had made 154/4; Yuvraj and Dravid tried to make a match of it by working singles and occasionally, managing the fours -- but the impetus Sehwag provided was clearly beyond the scope of these two batsmen, and Australia clawed back into the game. It could still have turned interesting, though -- Ponting was clearly delaying his fifth bowling option; had the Indian batsmen bided their time, they would have faced a situation where non-regular bowlers would have to bowl nine full overs. Pointing gambled by preferring to bowl out his third and fourth bowler, despite the fact that they were going for runs -- and the gamble paid off big time. In the 32nd over, Dravid under-edged a cut onto his stumps; a mode of dismissal he has perished too quite often; the shot ended a controlled, composed innings after coming to the wicket at a time of strife. Mongia came to the wicket and in the 34th over, played two successive square drives off Bichel. But in the next over Yuvraj, who was clearly uncomfortable against Hogg who turns the ball both ways with equal felicity, swung out once too often. A similar shot earlier had seen Martyn dropping him at wide long on -- this time, Lee was the fielder there and he made absolutely no mistake to the steepling, swirling catch. The situation here underlines what might have been, had the batsmen managed to hold their nerve. At the end of 35, Bichel and Hogg were both bowled out. McGrath's seven overs had proved costly. Lee alone had bowled with fire and control, but he only had four overs to go. Of the remaining 15 overs, thus, fully nine had to be bowled by the combination of Lehmann and Symonds; India at 209 after 35 were, in terms of runs, close to Australia which had made 217 at the same point. The situation was one the chasing team could have capitalized on � unfortunately, though, it had thrown away too many wickets by then. Martyn hammered the last nail into the Indian coffin. Mongia looked to chip over Symonds' head in the 36th over; it was a well conceived and executed shot but it reckoned without Martyn who, from mid off, spun around, raced back and dived to hold the ball as it came from behind him, dropping over his right shoulder. The brilliant catch made up for his earlier lapse; more importantly it underlined why this team is so good � its fielding and catching make even the most ordinary bowling assume lethal dimensions. With Mongia gone, Harbhajan and the rest of the tail folded with token resistance, and India succumbed by the margin of 125 runs. India fought better, and harder, than it had in the first encounter between the two sides; but in the final analysis it made too many errors, both when bowling and batting -- and against a side like Australia, one mistake is all it takes. Australia ended the tournament unbeaten, taking its winning streak to 17. More to the point, it emphasized that as a team, it plays its cricket in a different zone from the rest of the world. Earlier in the competition, an Aussie fan held aloft a banner that read: No Waughs; No Warne; No Problems. Shortly thereafter, the side lost Gillespie as well. You cannot think of any other contemporary side that could have suffered those setbacks and yet pulled through -- and that, more than anything else, underlines the amazing class, courage, of this all-conquering side. Post Script: It has been fun, bringing you the match reports, Panix Station and columns; fun (well, for the most part) to get feedback, much of which taught me things I needed to know. It is over now -- and after three successive Cups and six straight years of reporting on every game India played, I get a chance to move on to other things (though I guess I'll still contribute the occasional column). On my way out this particular door, thank you all for reading. Sub: India have nothing to be proud of!